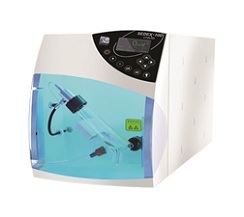 The SEDEX Model 100LT-ELSD for HPLC, U-HPLC, and SFC allows detection of all compounds sans a chromophoric group or electroactive group etc. The unparalleled SEDERE low-temperature technology combines maximum sensitivity, reliability and accuracy for the analyses. The detector is controlled locally or through a PC for fully integrated system using SEDEX drivers. Remote shutdown is available to reduce cost and enhance lifetime. Full SOP protocols are provided for GLP Compliance and validation. Offers the highest signal-to-noise ratio for all compounds. With SAGA (SEDEX Automated Gain Adjustment), an innovative gain control available when it is driver-controlled by software, SEDEX Model 100LT automatically adapts the gain setting to avoid any off-scale saturation of the detector. Wide choice of nebulizers and innovative cell design leads to minimized band broadening. Complete remote control for Gas heater, photo-detector and light source.